Epic Wednesdays consist of a monthly rotation of four improvised comedy shows that spoof such nerdy pursuits as role-playing and video games. Final Frontier opened last night to an enthusiastic crowd. From the staged recreation of Star Trek’s opening credit sequence to the ridiculous finale, the performers never missed a beat. The characteristic of improvised sketch comedy that most defines the phenomenon for me is its casualness. When it works, there is always that feeling of hanging out with your friends and poking fun at something. This is certainly intensified by the intimacy of the Comedy Bar venue and the fact that the audience is often comprised of large groups of people who already know each other and the performers. I suppose you’ll want to know something of the plot. Being unscripted, most of the particulars will be dependent on chance, but essentially, the story revolves around the crew of the USS Gordon-Levitt coming to terms with the re-emergence of their Vulcan crew-member who had recently died. There is a bit of backstory supplied by audience suggestion, but all you really need to know is that a lot of very funny stuff happens as performers riff on the familiar tropes of Star Trek storylines. There is something quite magical about the overall impression of this show. The Starfleet outfits are just brightly coloured T-shirts, black pants and the iconic emblem, but they’re surprisingly convincing. As is the crude star-scape that adorns the back of the stage—just some blue Christmas lights hung against black curtain, but man… when the house lights are out and the Jerry Goldsmith Star Trek TNG theme is blaring, it brings on the goosebumps! There is a wonderful tin-foil model of the starship that gets flown around the stage to highlight key moments. My personal favourite bit of stagecraft was the hand-fulls of sparkles that are thrown at someone to indicate that they’re being transported. One of the great things about improv comedy is that the mistakes are often as funny as the perfect one-liners. The limitations of the stage, the pressure of keeping the storyline consistent, the occasional corpsing… these flaws can, when the chemistry is right, be comic gold. 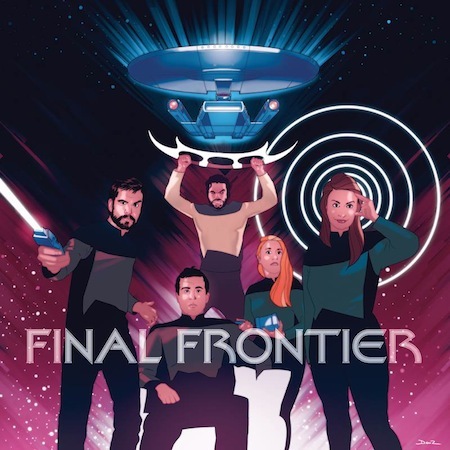 In the capable hands of this team—Etan Muskat, Jess Bryson, Liz Johnston, Alastair Forbes and Craig Anderson—Final Frontier is consistently entertaining. That might sound like faint praise, but it’s no mean feat to keep an unscripted hour of material consistently engaging. While not everything is laugh-out-loud hilarious, hardly more than fifteen seconds goes by without something to smile at. Final Frontier plays on (rotation with three other shows) at the Comedy Bar (945 Bloor Street West) until May 14. Shows are on Wednesdays at 8PM. Final Frontier plays March 19, April 2, May 14.